Maybe it was the brewing storm, but when I was walking along Glebe Point Road the other night, this local bottle shop window art caught my eye. 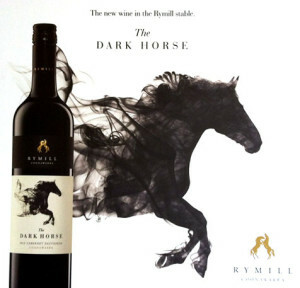 This gorgeous piece of graphic design is the label of wine brand’s Rymill’s newest 2015 Cabernet Sauvignon, The Dark Horse. Named in commemoration of Jane Rymill’s ex-Police horse, Adlai, a dark chestnut thoroughbred. Right now, we’re at the end of racing season. Whether you like racing or not, this is a sport that commands premium brand sponsors and top shelf prices. The graphic design concept is uncluttered. The message is clear. It works psychologically because it also pays homage to Australia’s recent champion, Black Caviar. I think this has been created with various Photoshop smoke brushes and an actual photograph of Adlai on a background layer. Although smoke brushes are often over-used at the moment, this is a perfectly appropriate example. The background photo makes for an excellent guide as well as gives good definition. Look at the front of the horse where there is a lower level of opacity. There is great definition in the front hooves, as the horse gallops away. The nose, chest and ears all have clean lines. Can you see the hairs from the the chin and nostrils? There are even eyelashes. Once you move past the legs and torso, the horse is just vapour, tendrils of speed. Yet, there is no clear-cut transition point from horse to apparition. This is a design piece that masters the art of precise whimsy. The classic Coonawarra typeface and the gold horses device convey power, freedom, and wild elegance. I’ve always been a fan of well-used kerning and the nice spacing between the RYMILL letters and the Dark Horse brand name add understated sophistication. I’m guessing it probably isn’t Adobe Garamond — my all-time favourite typeface — but it’s very similar. What’s it like to taste? If I didn’t have a two week old baby, I’d certainly be letting you know. The wine retails for $23.95. I think it’s worth it to enjoy the artwork while savouring. Kudos to the designer. A very handsome job. That would be Jim McGuinness’s work from Motiv Design Adelaide. I’ll pick up a bottle at the end of Dry July.